When scientists from the University of New South Wales' solar photovoltaic group fabricated their first solar cell in 1975, Australia was a world leader in the solar energy industry. More recently, a lack of political support for solar technology has seen some of those pioneering researchers leave Australia to take up opportunities overseas, and Australian solar companies become foreign-owned. Can we catch up to the rest of the world again? Once regarded as little more than hippy communes, ecovillages are attracting a lot of attention as Australians, driven by concerns about climate, sustainability and community, seek a more satisfying lifestyle alternative. But are they for everyone? It's the story of the largest movement the world has ever seen. A movement with no charismatic leader; that follows no unifying ideology; and which politicians, the public and the media don't recognise. But it has the potential to heal the Earth. Alexandra de Blas examines Blessed Unrest, a book by Paul Hawken, soon to start production as a ground-breaking film. A number of prominent experts and environmental groups have recently endorsed the kangaroo industry. So, exactly why is eating kangaroo 'good for you AND good for the environment,' as the current marketing slogan states? CSIRO's Dr Heinz Schandl and the Department of Climate Change's Dr Steve Hatfield Dodds explore the notion of 'decoupling' economic growth and environmental degradation. Faced with a growing catalogue of environmental priorities and having seen little real progress on solutions, a group of Australia's most eminent ecological scientists decided to take matters into their own hands. 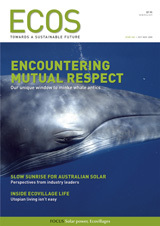 An April 2008 advertisement placed in The Australian newspaper by Green Cross Australia began a unique, deliberative process inviting the country to consider the role that Australians might play should sea-level rise and climate change result in a significant displacement of people in the Asia Pacific region. Thinking outside the box, a small regional government agency in New Zealand has taken its environmental education 'show' on the road – in an 18-metre-long 'big green box on wheels', called the Green RIG. The ANZANG Nature and Landscape photographic competition and travelling exhibition is celebrating its fifth year with another mesmerising set of images submitted by both amateur and professional entrants across the globe. Native bacteria to mop up toxic pollution?